Motivape, supplier of Aspire Pockex replacment Glass Tubes suitable for use in the Pockex. 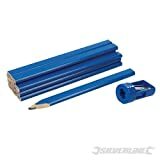 Woodwork Marking Carpenters Pencils & Sharpener Set 13 pce pieces 13 pce pieces Twelve soft lead, oval section carpenters pencils for marking timber and other materials. Includes sharpener. Profiler+ is the ultimate scribing tool for joiners, shopfitters, kitchen/window/bathroom installers and other craftsmen. Profiler+ has a robust construction designed to meet the demands of industry, sure-grip ergonomic design for ease of use and a compact size to work where space is limited. Profiler+ can reproduce any profile, on any material, with speed, accuracy and precision. Just SCRIBE then CUT & FIT. Precision Wheels perfectly sized for accuracy with the smoothest, free rolling action to avoid damage to finished surfaces. Adjustable Pencil Holder accommodates any marker (2-12mm) so you can continue to use your preferred implement. Easy Glide Precision Tip perfect for scribing very complex profiles such as skirting, stone walls or architraves, ensuring the perfect fit first time. Moveable Holder – position your drawing implement anywhere along the length of the Profiler+ body for the maximum range of scribing options. Compass Feature – compass for precise, perfect circles every time with a SureGrip robust, ribbed body for secure and comfortable grip in for any situation. The new Profiler+ is the ultimate scribing tool. Over 5 years in development, Profiler+ has a robust construction designed to meet the demands of industry, sure grip ergonomic design for ease of use and a compact size to work where space is limited. Profiler+ can reproduce any profile, on any material, with speed, accuracy and precision. Just SCRIBE then CUT & FIT. Profiler+ is adjustable to any pen, pencil or other specialist marker ranging from 2mm – 12mm diameter. Use the Profiler+ to scribe in-fill and show end panels; hard flooring; work surfaces; wall panelling; stud walls; dry lining; fitted kitchens; bedrooms and bathrooms; motor home / caravan installations; loft conversions; shop fitting and marine fit outs. Use with wood, glass, metal, plastic, ceramics or any other material that needs a precision fit. Fast, simple and easy to use! Professional Results every time. Any Profile: Smooth, precision bearing, easy-glide wheels perfectly sized to replicate any undulating surface, meaning that even the most uneven surface can be replicated onto your material with speed and accuracy, without marking decorated or pre-finished surfaces. For greater precision, the Easy glide tip is perfect for scribing very complex profiles such as skirting and architraves. Any Material: Whatever material you work with, just use the right implement for the job. The adjustable holder can adjust to hold a thin panel pin for scoring a surface or even an oval or triangular jumbo pencil. The Profiler+ scribe tool is only available online. It costs just £24.95 from www.scribe-tool.com Profiler+® is a registered Trademark.